I’ve been friPodding the Purple One for almost two weeks now. But it’s necessary since his latest album is actually a double (or triple) album. (Triple because of a new artistling he’s taking care of.) And wouldn’t you know it, my DVD/CD drive has been dead for the past few months, so anytime I had acquired music, I either bought it directly from iTunes or Amazon MP3, or somehow had it transferred to my computer one way or another… which is time consuming and a bit annoying for someone like me. All of that doesn’t matter now, I have a nice new external drive that does everything that I need it to do. Woot! 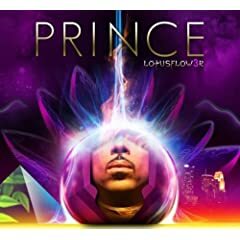 So onto what today’s iPick is: I decided to talk about the first album by the name of LOtUSFLOW3R(this is how iSaac reads it, so that’s how I’m spelling it). I’m not sure where to begin. I started with track 1, which is an intro more or less. This is one of those albums that I believe is built to be listened to beginning to end without stopping. You know, when songs fade into either other or its not exactly easy to distinguish when one song ends and the next begins. This is bittersweet. Especially if I get used to listening to an album beginning to end. But sometimes I only like certain songs, and if they are together, I want to hear them together which means no shuffle or else I am no happy! But that’s my own problem. Some more songs to take note of that I liked are “Crimson and Clover”, “Feel Better, Feel Good, Feel Wonderful”, and “77 Beverly Park” which is just a beautiful instrumental. There’s so much to this album that the more I listen to it, the more I find. It’s got romance, political, inspirational… and a little weirdness. Preferably the last song on the album. I’m not sure what it’s about. Honestly, I don’t know what half of these songs may be reallyabout. And I’m not sure if Prince would be the type of person to give a backstory on a song if there is even a backstory to give. But even if there isn’t one, the song still has a brand of awesomeness that can’t be denied. ‹ i had a dream, indoob!